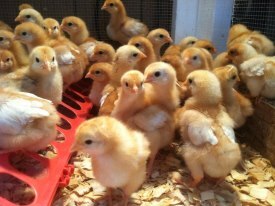 New chicks arrive at Russell Feed & Supply’s Azle location around June 6th. Follow us on Facebook for new arrivals. We recommend calling the store to confirm arrival dates, quantities and varieties— all are subject to change. Are you set up to raise a successful flock? We stock everything you need for healthy chickens and other poultry breeds: Coops and runs, chick feeders, chick waterers, heat lamps, feeds, treats and more! This entry was posted on Thursday, May 28th, 2015 at 11:40 pm	and is filed under Events, News & Updates. You can follow any responses to this entry through the RSS 2.0 feed. Both comments and pings are currently closed.